The Ease of Access screens in Windows 10 offer many ways to make your computer, mouse, and monitor easier to use. On the Settings screen, select Ease of Access. Choose Narrator settings (refer to the following figure) to have content on the screen read aloud. These settings are for people who have difficulty reading. After turning on the Narrator switch, you choose voice, speed, and pitch settings to determine what the narrator’s voice sounds like. 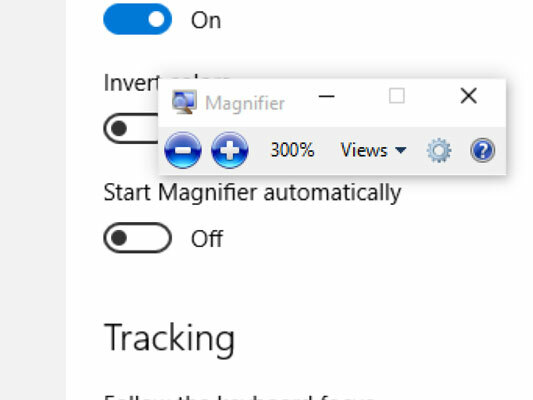 Choose Magnifier settings to enlarge what is on your computer screen. Click or tap the plus sign on the Magnifier toolbar to zoom a portion of the screen for easier viewing, as shown here. Click or tap the minus sign to see the screen at normal size. Without turning the Magnifier switch on, you can magnify the screen. Press the Windows key + plus key to zoom in using Magnifier. Press the Windows key + minus key to zoom out using Magnifier. Choose High Contrast settings to alter the screen in a way that might make seeing text easier. These settings are also for people who have difficulty seeing. After you choose a theme, you can choose a color for text, hyperlinks, disabled text, selected text, button text, and backgrounds. Click Apply after you make your choices. Choose None and click Apply if you want to return to the default Windows 10 contrast settings. Choose Closed Captions settings to control how subtitles appear in audio and video presenations. Choose Font settings to describe what you want the text in the captions to look like. Choose Background and Window settings to describe what the box where the captions appear looks like. The Preview box shows what your choices mean in real terms. Choose Keyboard settings to type without using a physical keyboard. This onscreen keyboard uses the layout of a conventional keyboard. However, most people find that the standard Windows 10 virtual keyboard is more flexible. Choose Mouse settings to change the size and color of the mouse pointer. 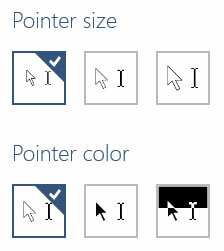 As shown here, Windows 10 offers mouse pointers of different sizes and colors. Choose the combination that tickles your fancy. Play Animations in Windows controls whether Windows apps start and close with an animation sequence. If you prefer not to see animation sequences when an app is launched or closed, turn this switch to the off position. Show Windows Background controls whether images can appear on the Start screen. If this switch is off, images don’t appear on the screen, and you can’t choose an image in the Personalize panel. Show Notifications For controls how long certain pop-up messages appear before disappearing. These notifications are sometimes called tooltips or toasts (because of the way they pop up). By default, notifications disappear after five seconds, which usually isn’t enough time to read a long notification. Note that notifications disappear when you move the mouse or select another option. 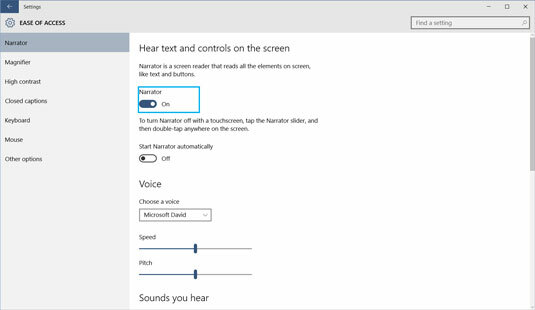 The Visual Notifications for Sound options make parts of the screen “flash” when they are activated. These options are meant for the hard of hearing. More Ease of Access settings are available through the desktop. The settings are easiest to access by pressing the Windows key + U (for usability). 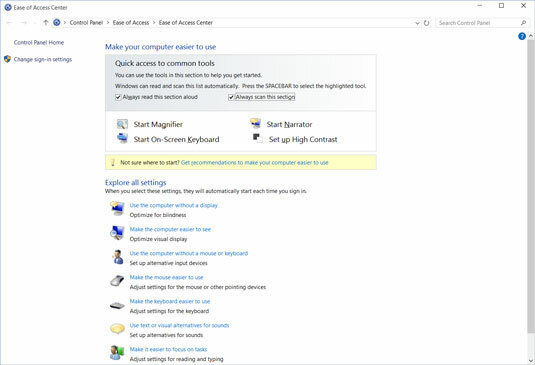 In the Ease of Access Center, as shown here, you can choose many access settings.